No, this isn’t a Nike endorsement. I don’t think I even own very much Nike gear. But, as I’ve discovered this week, their tagline is spot on. I hate to be a whiner. Spoiler alert: this post will be a little more whiney than usual. But, hang wih me, it lightens up a little. The marathon is T minus 130 days and counting. My long runs haven’t been spectacular, they’ve just gotten done. My shorter training runs have been spotty and inconsequential. I’ve been more than a little frustrated with lack of progress, and I’ve been really frustrated the last week about the lack of weight loss. So, I’ve indulged in little pity parties. And, instead of getting up early to run, I’ve rolled back over and snuggled down. Who needs it? I’m slow, ungainly, and obviously my attempts at fitness are misguided. When you envision me running, think penguin, not cheetah. The weight stays steady, but for this week, this moment, that’s not enough. Last week, I did a little cross training, but my running mojo was completely gone. There was no desire, no motivation, no deep seated voice screaming to get out there and run. So, I didn’t run. I had a very physical weekend coming up, and I used that as an excuse not to overtire myself. Yes, I really did justify it that way. The stressful weekend passed, and a new Monday dawned. I woke up at 7 am, too late to scrounge together running gear & get out for a run in this heat. If I’m not headed out by 5:30 am, heat stroke knocks. Last summer, I had my first bout with heat exhaustion and it nearly derailed my half marathon training. Fortunately, the fall race was my third of the year and I had built a relatively strong running base, so my training didn’t suffer over much. The marathon is a different animal entirely. I haven’t attempted this distance before, and I know from my training runs that you can’t cheat this distance. So, this morning, I was headed out by 5:15. Happy? No. Just doing it. My mojo has fled, but I know that the only way to get it back is to Just. Do. It. So I am. One foot in front of the other. One day at a time. I wouldn’t mind some cheering from the cheap seats. Today is Father’s Day. I’m sitting on a balcony overlooking the lazy Bouie River in a beautiful bed & breakfast with my favorite man. So, it’s been a good day, one that started, as it should, in God’s house, with worship and praise, and is closing with quiet reflection on a lifetime of blessings. We spent the evening at the movie, watching “The Green Lantern”. Great flick, meant for mindless entertainment. I guess the combination of the day set aside for Father’s and a movie about facing and overcoming fear were too much for my mind, and I was flooded with thankfulness for the men in my life who have taught me the meaning of overcoming fear. When I was a young teen, I remember my Dad telling me a story about his childhood and learning to overcome fear. I wish I could remember the full tale. My dad was a wonderful story teller in his day, and I’m sure added his own embellishments. The details of this story elude me. It involved my grandmother, a frying pan, and a critter, but that’s really all I can come up with. What I do remember was the “moral” of the tale. It ended with my grandmother telling my dad that no matter what else happens, you have to learn to face your “boogers.” What ever those may be. “Face your boogers” became sort of a motto for me. Whether Daddy intended that or not, I don’t know. But, it helped me overcome my fears during some tense moments of my life. Learning to dig deep and draw on that well of faith that lies buried deep within me – I know my Daddy did intend for that to happen. He was very intentional about teaching me about faith. He lived it, modeled it, taught it. I’m so thankful. My sister and I had a conversation about that just the other day. I made the remark that if I could give my children, nieces, nephews, their friends, and my friends one thing, it would be my faith. I wouldn’t leave them money, even if I had it, I would leave them my faith. She reminded me that, unfortunately, it doesn’t work that way. They will each have to travel the paths of their own journeys in order to build that deep pool of faith to keep in reserve. That’s true, but I know that my faith pool was started at the knees of my sweet daddy. The legacy he is leaving me is a rich one. Not by the world’s standards, maybe, but certainly by God’s. And, although I can’t give my faith away, I can share it. That’s surely the beginning of everyone’s journey, seeing faith in action. I pray that I can be faithful to that legacy. What does this have to do with running? Nothing and everything. I wouldn’t be on this journey without the legacy of faith my father, then my husband, have built for me. I’m very humbly thankful. Running teaches me so much about life. One of the greatest lessons I’ve taken from running is the value of persistence. We talk about discipline and marvel at it in world class athletes. I have friends and family who think that I’m very disciplined. Not the ones who really know me, just the ones looking in from the outside. Because I’m not that disciplined. I’ve learned tricks along the way to make me stay in the game, but discipline? Not this runner. I struggle just like everyone else, probably more than most. Persistence, on the other hand, should be my middle name. I am truly like that proverbial dog with a bone, I don’t let it go until every ounce of goodness has been stripped from it and it lies forsaken in the grass. This character trait serves me well in running, particularly when I have weeks like the last one. I’ve mentioned before about the community of people who are my support staff. http://jrichardsoriginals.blogspot.com/2011/05/it-takes-village.html They play such a pivotal role in my training. Last week, at a running clinic I’ve been attending conducted by my friend, Mary, we identified something that will probably be one of the most important issues I’ve ever addressed as a runner. It had to do with my running form. I know that the most effective foot strike is mid foot, with slightly bent knee. I’ve been doing that for years. Imagine my surprise, then, when I watched a video of myself running and I clearly landed on my heel, knee straight as a board. No wonder my hip bothers me so much!! So, since I thought I was landing mid foot all this time, but wasn’t, how do I remedy that? How do I know how it feels to do it right? A short run the morning after the discovery wasn’t particularly helpful. I was in my head the whole run, couldn’t relax, and didn’t know if I was doing it correctly or not. I was very discouraged, and I really let it wig me out. I’m a person who knows how to have a pity party on a large scale, so I threw myself one and didn’t run the rest of the week. Fortunately, I have a village of accountability partners who won’t let me wallow in my pity. My husband, who I thank God for many times daily, reminded me that I can do this, it’s just a matter of doing the work. He actually used something I had said a few minutes earlier about someone else not wanting to do the work it takes to become more Godly to urge me along. Hate it when he uses my words to bite me in the rear. But, it was effective. I also have a prayer warrior sister who takes the time to pray with me and for me when she knows I’m struggling. Thank God for family who understand, support, and encourage! I think my point this morning is that discipline is simply about not giving up. I have set some rather lofty goals for myself for this year (and beyond) that I will never achieve if I let every set back discourage me. I have to dig down and find my inner dog sometimes, but she’s there. Ready to take on the world and keep me plodding along. Suffering and perseverance. Sounds like Paul was a runner. Inspiration comes in the strangest ways. I’m often inspired by a beautiful sunrise or sunset, a classic work of art, a book that I’ve picked up. As a runner, inspiration goes hand in hand with motivation, and most of the time my inspiration is that 26.2 miles won’t run themselves and November 6 looms large. This weekend, though, I was inspired by a group of 8 men, a mountain, and a motorcycle. 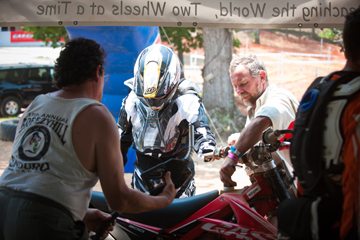 My husband, Gary, has been an Enduro dirt bike racer for a number of years now. He loves it, he has fun with it, and even though he’ll say it’s not true, he’s pretty fast for an old dude. (He’ll deny the fast part, not the old dude part). 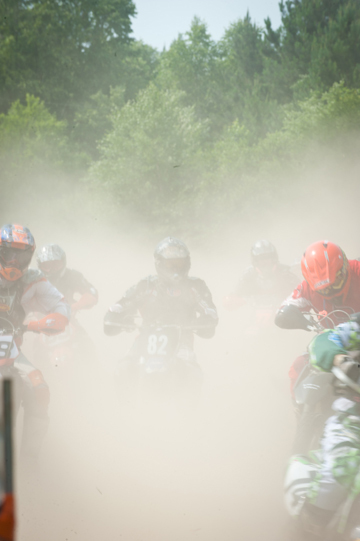 A few months ago, he was asked to be part of a six man racing team that would participate in a 24 hour dirt bike race through the woods of Perry Mountain, Alabama. This team would be an outreach arm of a ministry run by Pastor Gasper “Doty” Pizzolato and his wife Gracie and is called Team M.O.R.E. 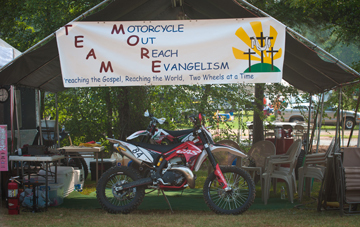 (Motorcycle Out Reach Evangelism). Let me stop here and say a word about Doty and his beautiful wife. They are an inspiration in themselves. Doty is a lay preacher who spends his weekends during race season in the woods, ministering to fellow dirt bike enthusiasts. He offers a church service on Saturday nights and brings a fresh word from God each time he stands before the men (and their families) who come to hear him speak. He is very dedicated to this ministry, I’ve seen him show up at a race in a rental car because his truck broke down on the 6 hour trip, or have to rent a motel room because his camper broke down on the way to the race. Did I mention that this is an unpaid position? Doty does this because God has called him to it. He and Gracie head up Team M.O.R.E. 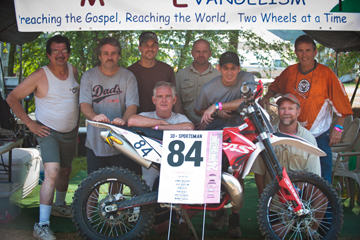 which is a non-profit organization that raises money to purchase motorcycles for missionaries all over the world. I’ll post a link later this week where you can learn more about Team M.O.R.E. and how you can be a part of reaching others for Christ, two wheels at a time. I really enjoyed getting to know Doty and Gracie a little better this weekend. Back to the mountain. I went with Gary, not really knowing what to expect. Most of the time when I go to races with him, I enjoy a trail run, lots of quiet time (which I usually spend reading or writing), a grilled steak, and a nice weekend with my man. This weekend would be different, I knew going in. Gary and I are typically in bed by 9:30 (on a night when the Braves are playing) and up early. I wasn’t sure either one of us was up for an all-nighter. 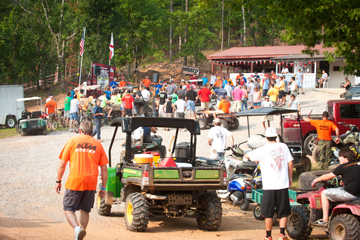 The race started at 10 am sharp Saturday morning. At 10 am on a June morning in Alabama, it’s hot. Throw in no rain for a while, a mountain, and a slew of other men/women on bikes all jockeying to be first along the trail, and you’ve got yourself a race. The men worked as a team, each rider doing two laps that took approximately an hour, then coming in to pit row for a gas refill, bike check, new rider. This went on through the heat of a June afternoon (temps reached 103 by some accounts). Doty and Bobby were support, the riders were Manny, Jack, Erin, Benny, John, and Gary. These are men from all walks of life, some coming from as far away as Texas to spend a long weekend raising money for the cause of Christ. I was inspired by them as individuals who spent time, money, effort, and huge amounts of sweat to come together as a team and pull off this incredible feat of endurance. By midnight, they were exhausted, overheated, and now riding a dusty, narrow, heavily traveled, wooded trail on a dirt bike in the dark. Shortly after midnight, we got the distressing news that we had a rider down. Jack had wrecked and we spent a long half hour or so waiting to hear how badly hurt he was. Turns out, he broke his collarbone badly and Doty transported him to a nearby hospital for x-rays. This put us down a man and we lost a lap. We had another man who was resting to recover from a bad spill he had taken earlier in the evening. The team was down from six to four men, but they stepped up and covered the time as best they could. No rest for the weary. Most of the men made do on a cat nap and a fervently lifted prayer. They ended up taking fourth place, only a minute down from third, having made up the lost lap and bounced back from fifth right after the accident. A true testament to team work!! I ended up enjoying the weekend very much, making some new friends, and feeling like 26.2 miles will be nothing compared to that!